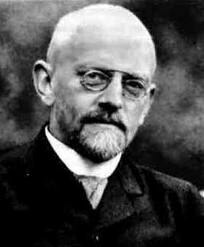 David Hilbert was born in Koenigsberg, East Prussia, on January 23, 1862. He was a great leader and spokesperson of mathematics in the early 20th century. Like most great German mathematicians, Hilbert was a product of Göttingen University, at that moment the world’s mathematical center, and he spent much of his working life there. His formative years were spent at Königsberg University where he developed fruitful scientific exchange with his fellow mathematicians Adolf Hurwitz and Hermann Minkowski. At the University of Koenigsberg, Hilbert studied under Lindemann for his doctorate, which he earned in 1885. One of his friends there was Hermann Minkowski, who was also a doctoral student. In 1884, Adolf Hurwitz was appointed to Koenigsberg University and became friends with Hilbert, which was a very significant factor in Hilbert’s mathematical development. David Hilbert was a member of staff at Koenigsberg from 1886-1895, being the Privatdozent until 1892. He was then an Extraordinary Professor for one year before becoming a full professor in 1893. David Hilbert was preeminent in numerous fields of mathematics, comprising axiomatic theory, algebraic number theory, invariant theory, class field theory as well as functional analysis. His calculus examination led him to invent “Hilbert space,” considered to be among the primary concepts of functional analysis as well as modern mathematical physics. He founded fields such as modern logic and met mathematics. In 1899, David Hilbert published his book – The Foundations of Geometry – in which he described a set of axioms that eliminated the flaws from Euclidean geometry. In the same year, American mathematician Robert L. Moore also published a set of axioms for Euclidean geometry at age 19. While some axioms in both systems were similar, there was a feature about the axioms that were different. Hilbert’s axioms were theorems from Robert Moore’s and Moore’s axioms were proved as theorems from David Hilbert’s. After the achievements with axiomatization of geometry, David Hilbert developed a program to axiomatize mathematics. With his attempt to achieve his goal, he began a “formalist school” of mathematics which opposed the “Intuitionism” of Brouwer and Kronecker. Meanwhile, Hilbert was expanding his contributions to math in various directions partial differential equations, mathematical physics, and calculus of variations. He knew that he could not achieve this by himself. In 1900, Hilbert gave a massive homework assignment to all mathematicians across the world. He did this when he presented a lecture, entitled “mathematical problems” before Paris International Congress of 1900. Hilbert proposed 23 mathematics problems to whose solutions he thought the 20th century mathematicians ought to devote themselves. These mathematics problems are now known as Hilbert’s problems and many of them remain unsolved today. Hilbert courageously spoke out against repression of Jewish mathematicians in Austria and Germany in mid 1930s. However, after mass evictions, several suicides, and assassinations, he eventually remained silent. He could only helplessly watch as one of the popular mathematical centers was ruined. Hilbert died in 1943. His funeral was attended by fewer people and barely reported in the media.